In the Authorized Version of the scriptures (KJV), Jesus said not to use "vain repetitions" when we pray [Matt. 6:7, NRSV "heap up empty phrases]. And when you think about it, both testaments of the Bible are quite free of this kind of repetitiveness. Some churches even avoid repetition in hymns. For example, I was a Methodist most of my life, and I am accustomed to singing their tunes to most hymns. In some cases theirs differ from other churches' tunes, and in these cases, it's not unusual for the Methodist version of a hymn to avoid what John Wesley would've called vain repetition. A good example is Take My Life and Let It Be Consecrated. The nicer, more uplifting tune, Hendon, requires the final phrase to be repeated. And so the Methodists are accustomed to singing the much duller tune, Messiah. Though not as uplifting as Hendon, a better non-repetitive tune would be Vienna, which the UCC employs. 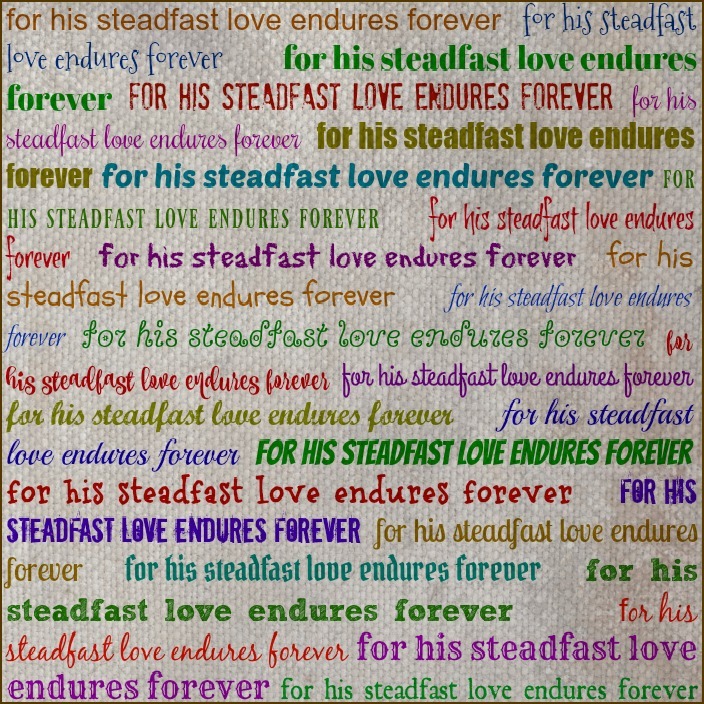 So why all the repetition in Psalm 136 of the phrase "for his steadfast love endures forever"? Wouldn't that be considered "vain"? This is especially true of Christians' view of the Old Testament. "My God is the New Testament God," I've heard people tell me a million times over. "The Old Testament God is angry and vengeful, but my God is the God of love." Of course, there's the story in the New Testament [Acts 5:1-11] of the enlightened Christian's preferred God striking a husband and wife dead. And there are plenty of places in the Old Testament that proclaim not just God's love, but God's constant love. Here in Psalm 136, this proclamation is made 26 different times. If it's "vain repetition," then the only thing making it "vain" is human unwillingness to accept that the God of Israel is no less the God of love than the God of the Christian apostles. 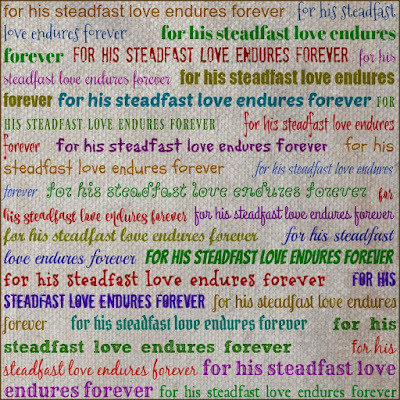 So let me read this psalm this morning, not rushing past or skipping over the repetitions, but concentrating on them as the main point, for, indeed, God;'s steadfast lov endures forever.